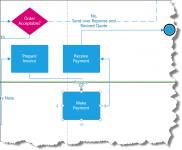 Each blue box in the business process diagram is a businessactivity like “Prepare Requisition” or “Prepare Request for Quotation” usually supported by an IT application’s user dialog. For a web application this might be an HTML form or a Java user dialog. 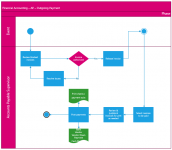 In some cases, the business activity itself has a more complex workflow of business activities and therefore is depicted by a separate diagram. 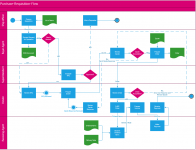 To simplify the documentation (modeling) of a business process flow model, more complex business activities are detailed into a separate business process model called sub-process models and linked to the respective business activity.